There’s a writer who calls herself Lucy Lips. I’ve been reliably informed Lucy is in fact a man, Harry Toube — who writes at times for the Guardian (no wonder it’s going bust) who used to be on the Pro Pal side of things, till he saw the light — or the dark, depending on your point of view. Anyway, whatever the reality, Luscious Lucy has made a number of truth claims to justify her smears of me and a number of other suspended comrades. Let me be clear, I have no problem with gender bending, in fact I’m all for it, but bending the truth for political purposes, in particular, when it not only affects the reputation of individuals but the Party you claim to support — that is a deviation too far and worse, it’s just plain intellectually LAZY Lucy. After all, it would have taken little research to know that I was not the first, but the third person, to ask what definition was being used by the Jewish Labour Movement’s so-called trainer Mike Katz (for goodness sake, why would I say there was not ANY definition of antisemitism I could work with? I earned my living as an anti-racist trainer for years). Mind you, the coyness of Katz in defining his terms was understandable. Having taken participants through a session that was remarkable only for its lack of theory or evidence to back up his sweeping claims of antisemitism, not just in the Labour Party but in the country as a whole, Katz knew the IHRA definition he was reluctant to confess he was basing his session on, would be torn to shreds by a significant and well informed proportion of the audience. By the way, the IHRA definition being touted by every Israel supporting and right wing hawk in town at the moment, is in fact a re-hash of an earlier definition which had been rejected by …. virtually everybody, and for good reason; it makes neither legal or ethical sense. Having understood what an effective tool false accusations of antisemitism might be, some bright sparks realised that if the tried and tested definitions of antisemitism (you know, for example, hatred of Jews for being Jews) was not doing the job of protecting Israel and its Zionist friends, they would just have to come up with — yes you guessed it — a ‘New Antisemitism’. And this ‘New Antisemitism’ could then be backed up by a new definition that could be as self-serving to the interests of Israel as they needed. Personally, whenever people stick a ‘new’ in front of a term, I shudder — you know, New Labour and all that! But for those from that ‘New’ neck of the woods, they took to this New Antisemitism like ducks to water. 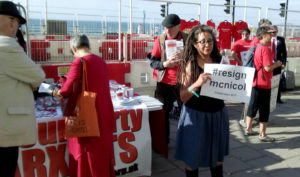 Now it seems there’s an issue in Labour, for while the Compliance Unit of the Labour Party, for example) has adopted the full IHRA definition, including all the ‘we mustn’t criticise Israel’ nonsense, the leadership of Labour appear to have only adopted the first paragraph, something that all good people should be happy to sign up to. But let’s leave this drivel for the moment where it should be — dripping out of Lucy’s I suspect not so luscious lips. And Lucy, you naughty girl, not satisfied with bending the truth with your rendition of the training session (if you haven’t, I suggest you watch/read at least one of the alternative narratives to the Zionist propaganda you have been so enthusiastically wrapping your lips around, the Aljazeera documentary The Lobby for example http://www.aljazeera.com/news/2017/01/lobby-episode-2-training-session-170112085805744.html or the statement by Free Speech on Israel made by witnesses who were actually at the training session http://freespeechonisrael.org.uk/jewish-labour-activists-defence-jackie-walker/#sthash.uauWqafU.dpbs.) you then turn your doubtful vision on the workings of the Steering Group of LAW … and vision is the right term isn’t it Lucy unless you have been, or are, a member of the LAW Steering Group? Because the truth is Lucy, whatever you have been taking, whoever has been feeding you this narcotic brew of smear and half-truths, you actually have no idea of the reasoning of the Steering Group or the discussions that led to the request for exclusions do you? And in any case, anyone with any knowledge of me knows my antipathy to Gerry Downing in particular is long standing. I will not share a platform with Downing or Donovan because their ideas lead in the direction of anti-Semitism, as well as to ‘the socialism of fools’. Now you could say, why didn’t you leave LAW straight away? Well, some of us believe, when we are part of a group, we should allow democratic and political process to go forward before making any such decisions. And by the way, what makes you think I love the Labour Party ‘the most’? Most of what? Or is that just another meaningless rhetorical flourish? As for your take on my record — jeez — as football supporters might chant, “who the f….ing hell are you?”. I have nothing to justify, certainly not to you, a true non-entity, someone who won’t even apply their real name to the nonsense they write. I’m more than happy with what I’ve achieved. I continue to serve the agenda I began with. I’m not stoking the fires of a witch hunt that is benefiting the enemies of our movement. Not helping to silence the voices of minorities who are not just the victims of bigotry but are excluded at all levels, not only of the Labour Party but of British society as a whole. I’m not backing a settler colonial regime that seeks protection behind a wall of the most offensive allegations and devious actions. I’m not supporting a disciplinary system that would be laughed out of any British court or industrial tribunal. But hey, why would you, or people of your ilk Lucy of the Lips, concern yourselves with the oppressed when you have the poor, browbeaten, friendless Israeli state to defend? Especially when, according to Labour Friends of Israel Chair Joan Ryan, there is in fact no other racism in the Labour Party except … yes you guessed it… anti-Semitism http://www.lfi.org.uk/analysis-thornberry-lays-out-labours-israel-agenda/. Mind you if, as a (Jewish) comrade said at the launch of Jewish Voice for Labour this year, Labour is so riven with antisemitism, I would say, given the level of representation of Jewish MPs, given that the last Leader (a Jew) had to defeat his Jewish brother for the post, that the present leader is a life long anti-racist well known for his good relations with Jews in his constituency, that there are Jews in key positions as advisers in the Labour Party and of course, as you noted, as Chair of Momentum, given all that, if the Labour Party is rife with antisemitism, it’s really not doing a very good job of Jew hating is it? Whereas the witch hunters — they seem to be victimising anti-Zionist Jews very nicely indeed. By the way, you have no idea of me, my record. And you — I say again, who are f***ing hell are you? I suggest until you have the courage to put your name to the crap you write, until you manage to grow a pair (of ovaries or balls) Lucy, you should just crawl back into the incognito hole you came from.